A gnome celebrates with dog food flavored ice cream after getting his car stuck in a ditch that was haunted by a ghost pigeon. Apologies for not blogging as much as I had mentioned! I swear we're not dead. Over the past few days my sister and I have been chillin' in my aunt and uncle's sweet Texan pad and have quite a few stories to tell. My aunt warned my sister and I about blind old Muff's plate of wet dog food on the floor by the stove and to be careful not to step in it. The next day, while my aunt was showcasing a range of select breakfast cereals, I noticed she had pulled out my second favorite cereal (Special K Fruit and Yogurt.......the yogurt clusters are like a deliclious pods of surgary surprise). 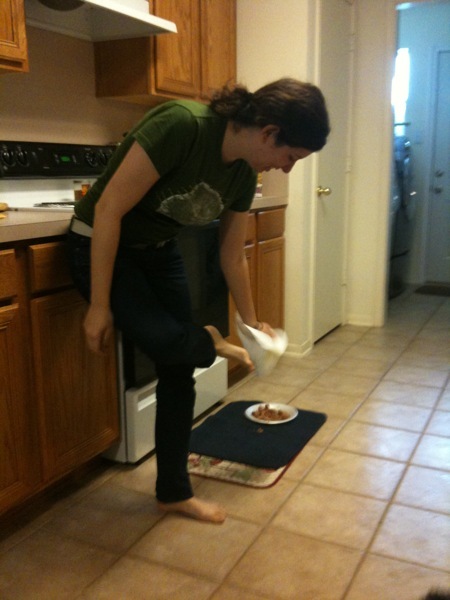 As I belined for the cereal, I slid through the dog food and my Aunt almost died from laughter. I turned to Muff and said, "I'm so sorry about the skid mark through your food..." After cleaning off my foot and trying not to ralph in the sink, breakfast was had, and I mentioned to my Aunt the my sister and I had been blogging on our trip. She hopped on the computer and read the title of the post about the cactus/ gnome combo and turned to me and said, "..........there's a gnome in your trunk?.." I said yes and a cactus in the cup holder....."a gnome...?" Yeeeees and a cactus in the..."I know Audrey but I can't believe you have a gnome in the turnk." What? why? "Because your uncle Brian told your cousin Kayla that her ex-boyfriend is no taller than a garden gnome.." Laughter ensued and the rest of the day was spent meezing (Texan for "sleeping") and later that night my aunt and I went on the hunt for ice cream while my sister meezed for a million years. The next day, my sister's foot bonded with the plate of wet dog food and I was forced to re-learn how to drive a stickshift.... I backed the Mini Coop into a ditch.... It took my sister at the wheel and me getting out to push to get that thing back on the drive way (and of course later that night my uncle brian left me a voicemail in his nerdo voice saying, "yo my mini cooper's stuck in a ditch and I can't get it out!! "..thanks uncle B....my self esteem is higher than the moon right now) As soon as we got on the road and my sister convinced me we weren't going to die, we went and visited my grandma at the cemetery. She hangs out there sometimes...when she's not at my aunt's house turning on the tv or walking down the hallway. We had a good sit, viewed her very nice marker, and commented on the old man who was driving a lawn mower like a bat outta hell. He was seriously mowing down (ha) all in his path, like the fake flowers on peoples' graves and mini angel statues. After we visited the dead, we went and ate sandwiches. Somehow during our time at Subway, my aunt had Eric Clapton on the brain and told us a story about how my cousin Kayla used to dance to "Cocaine" and then we got on the topic of how some people store bags of cocaine up their butts (haha "crack" cocaine). 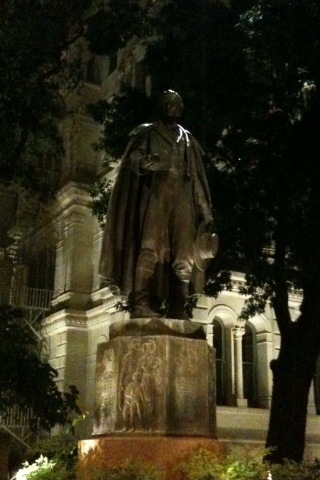 Good times.Later that night we decided to go on a boat ride and a ghost tour in downtown San Antonio. The boat ride was lovely and my aunt ALMOST got pooped on by a bird, which is weird because I guess if there's a bird and my aunt in the same space, it will poop on her somehow. After the boat ride, we met up with some old timey, cowboy figure for the ghost tour and my cousin had to pee like a racehorse. The tour guide was strangely concerned with finding a place for my cousin to relieve herself but he eventually gave up and she just had to deal, and she dealt with it very well. The starting point of the tour was across the street from the Alamo (alimony....ala mode...kinda looks like a pile of ice cream anyway..apparently ice cream is two words? no one bothered to tell me....jerks...just had to go correct all the places I mentioned ice cream in this post..btw my sister was the one who told me about the 2 words thing and now she's snorting behind my shoulder and sticking her shoe in my ear....they're not even her shoe!....o_O) Anyways, I was talking about the Alamo being diagonal from Ripley's Believe It or Not.. I know right? Definitely did not expect it to be there....So the ghost tour began and the man passed out some ghost hunting equpiment like thermal meters, E.L.F. monitors, and dowsing rods. The thermal meter is essentially a laser gun that records the temperature of the first surface it hits and can also blind someone if you point it in their eye. The nice tour guide highly recommended not shooting a cop or through hotel windows because you never know if you've just blinded some poor soul. The E.L.F. monitor made me think of Christmas but they're really for detecting changes in magnetic fields within a 6ft radius of the monitor. Apparently they can go wonky sometimes because of wires under the ground and the tour guide assured us we were not experiencing ghosties. The dowsing rods are supposed to measure negative and positive energy which apparently people can control? I don't know. My sister got pegged for having a skeptical face and the tour guide made her come to the front of the group and ask the rods to point to some other girl in our group and they did. No one else seemed to notice that the position of the girl was also the location of the river behind us, so I'm thinking that's what the rods were reacting to. My aunt on the other hand asked the rods a truth or false question about whether or not my grandma is living in her house and the rods swung in the direction of true so I don't know what was up with that because I've seen some weirdo stuff around this house involving our late g-mizzle. My sister and I just think my grandma is inside of Muff because they're both blind. 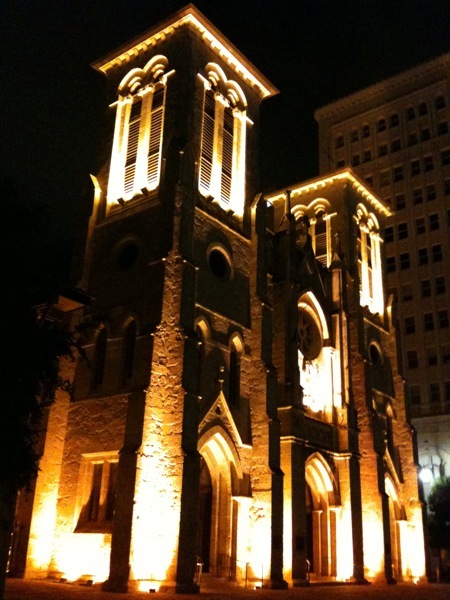 Speaking of blind, on our tour, we walked by an old church and in the corner of a buttress (possibly flying buttress?) 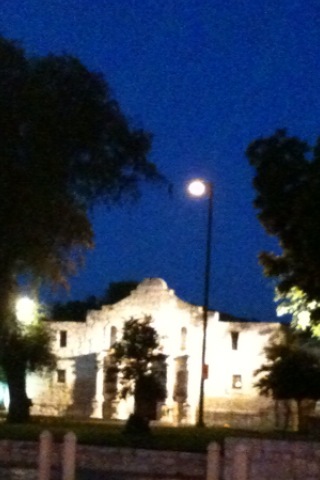 there was a scraggly old pigeon that was apparently San Antonio's only ghost pigeon. As soon as he said "ghost pigeon", everyone and their mom (literally there were like 2 moms on the tour) pointed their laser beams at the poor pigeon and I swear I could feel it going blind. We ended the tour at the old Spanish Govenor's House. Side thought, it has just come to my attention (thanks Kate) that the adjectival form of the word "Govenor" is "Gubernatorial"....Gubers.....I don't believe it and if you don't believe it either, look up it in the dictionary. You will be wowed. Anyways, the tour ended with a story about how back in the olden times, if a man abused a woman and / or child, and later decided to confess his sins, the residents of the govenor's house would hog tie the offender's hands and feet. They would also tie a noose around his neck (but not tight enough to hang him) and throw the rope, that was connected to a donkey, over a tree branch, The donkey would slowly raise the body off the ground and when the residents decided that the offender was in the worst pain he could possibly be in, either the woman he had attacked, or the mother of the child he had abused would take a stick and beat him until his innards spewed out. By the way, this is the origin of the pinata. Cheers.